Rich red captures attention - evoking excitement and deep passion. The romantic rose-red of this dress is barely tamed by the black netting overlayer, enlivened with lush embroidered vines. Dress is soft, beautifully-draping viscose rayon jersey knit, with black nylon net. Hand wash. 40" long, sizes S-XL, 2X, 3X. Imported. Also available in Emerald Green or Royal Blue. I bought this for my daughter-in-law for her birthday. She had seen the catalog at our house and admired the dress. She was surprised and delighted to receive it. She said she will wear it on a special occasion. It looked cute on her. 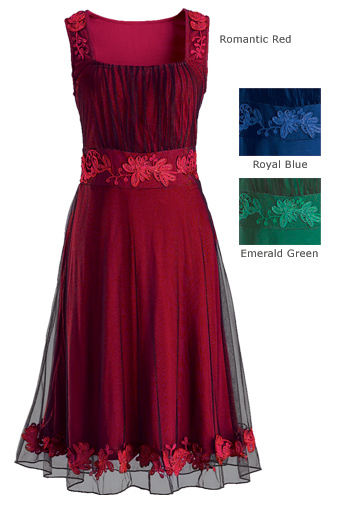 I may buy her the other two colors "just for fun" as I really liked the green and everyone needs a little red dress to wear at a funeral for "THAT" person! I really, really love the dress. the color blue is also beautiful. But what I like the most is the material because, it is really soft and comfortable on the body. I highly reccomend it. Thank you very much. Beautiful dress and wish it fit, but my bust is not large enough to fill out the top. Should have listed to other reviews that had the same issue. I bought the red and green and now I want to buy the blue! REALLY 4.7 THE OVER DRESS. LACE IS VERY DELICATE AND RIDES UP. THE DRESS IS AS BEAUTIFUL AS PICTURED, BUT WILL BE EASY TO DAMAGE. I WILL BE EXTRA CAREFUL I LOVE IT!!! This dress looks much better in the catalog picture. Nowhere near worth the cost.